Learn all about how to apply for MSCA Individual Fellowships and other European research grants.. The meeting will take place 9 August 2018 at the facilities of the German Chamber of Commerce in Beijing. You can attend the meeting in person or join the online Wechat webinar. The focus of the first event in the Grants in Practice series in China will be the MSCA Individual Fellowships. Researchers in Beijing interested in other European funding programmes like European Research Council and Horizon 2020 Working Programme and have questions are also encourage to join and use the opportunity to get answers. 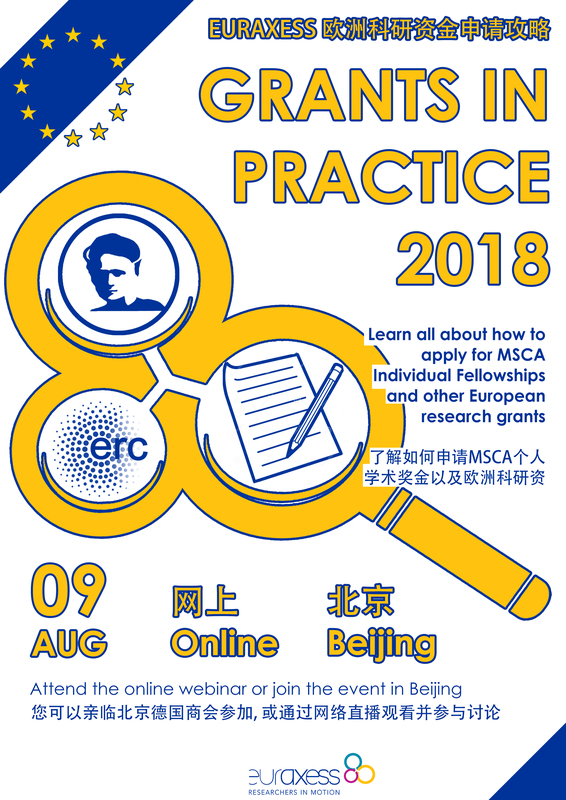 The Grants in Practice 2018 in Beijing will focus on the MSCA Individual Fellowships (IF). The IF are an excellently funded fellowships open to Chinese researchers of any field and career stage that want to do short term research in Europe. We will go through the details on how to write a proposal and how to apply. We will answer any questions that potential applicants may have and hear the experience of a succesful Chinese Marie Curie Fellow. The deadline for the 2018 call is 12 September 2018 - so if there are any questions now is a great time to get answers! The second half of the event will be dedicated to testimonies from 2 different succesful Marie Curie Fellows. Their talk will give the attendees an opportunitity to get a practical insight into how it is to apply for such a grant and how it is to be a Chinese researcher in Europe, as well as asking them questions. The event will take place 9 August 2018 from 14:00-17:00 at the German Chamber of Commerece in Beijing and will also be concurrently broadcasted as a Wechat webinar. Participation in the event is FREE of charge but requires registration. The German Chamber of Commerce in Beijing is located at the 8th floor of the tower 2 of the Landmark Towers, number 8 North East 3rd Ring-Road Beijing (亮马河大厦 - 北京市朝阳区东三环北路8号(近农业展览馆)). See the location on Baidu Maps here. For participants that are interested to only participate in the webinar please note that it also requires registration. When registering please make sure to indicate that you are interested in the webinar.